I’ve been saving a treat to share with you during this last week before Christmas. 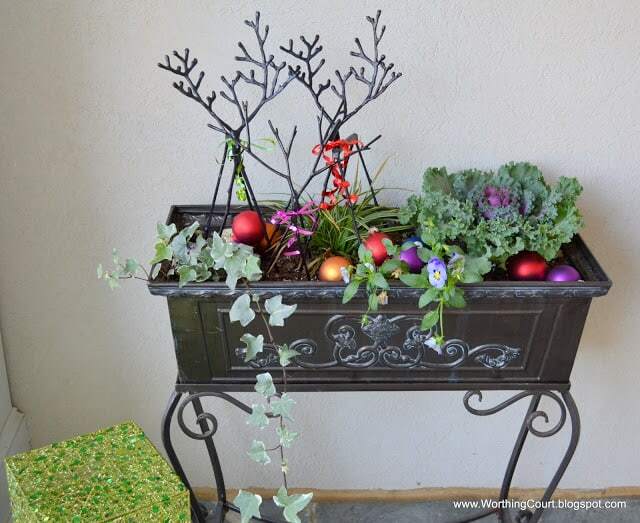 My friend, Nancy, graciously allowed me to share her beautifully decorated home with you. 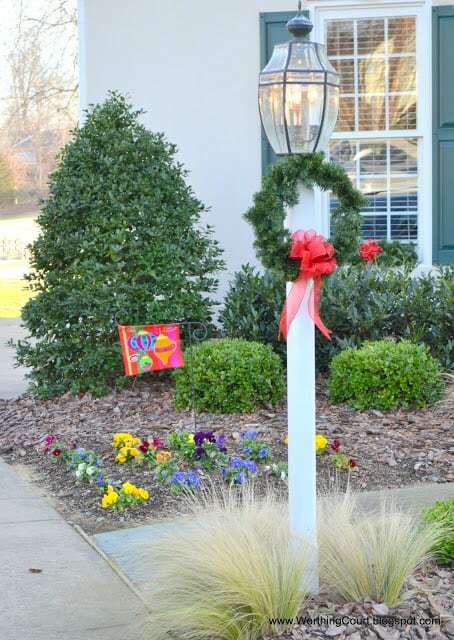 A lamppost with a sweet wreath welcomes you as you arrive. There are lanterns to light your way to the front door at night. 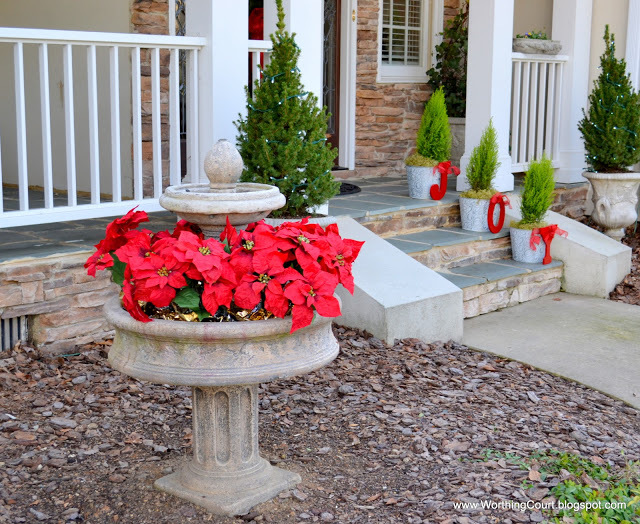 The water in the fountain has been drained for the freezing winter months ahead and filled to the brim with poinsettias. Of course, these are faux as natural ones would never survive in the cold weather. Spruce filled pots ascend the steps to the front door. Nancy attached painted letters with pretty red ribbon. 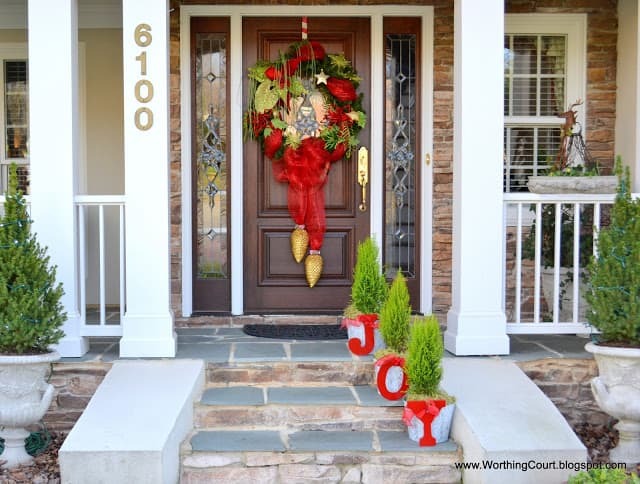 The front door is adorned with a fabulous wreath! 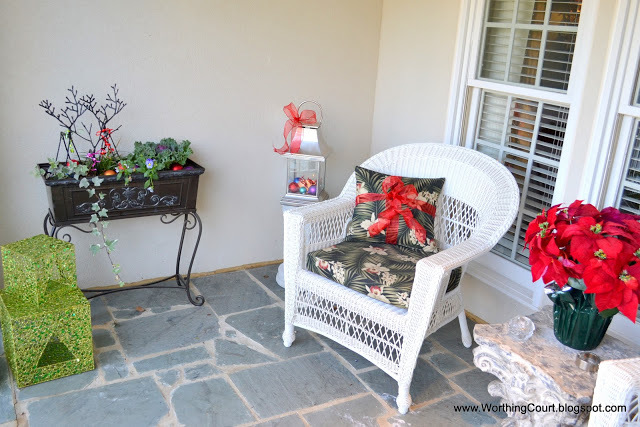 A welcoming vignette is located to the left of the front door. Aren’t the stick reindeer cute??? 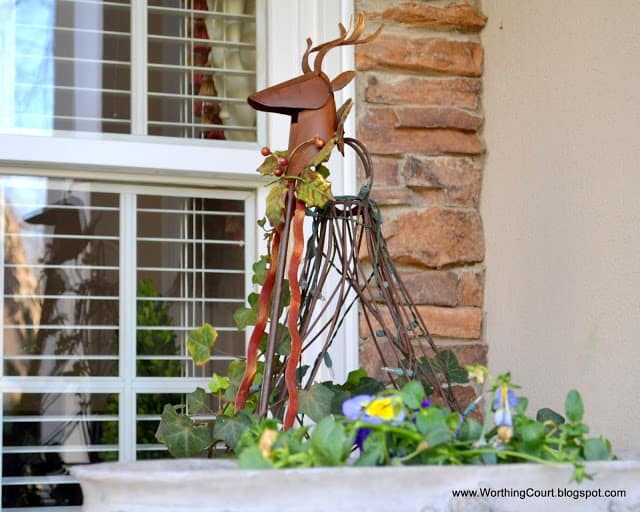 I love this reindeer head that sits atop a topiary form in an urn to the right of the front door. Should have taken a picture of the whole urn, I guess. This is just the beginning! Come back on Tuesday when we’ll take a peek inside her dining room and living room. What an absolutely gorgeous home! The decorations are perfect! Looking forward to seeing the rest! Get in line for the wreath! I just sayin!! Nancy’s home is absolutely gorgeous! Just the perfect amount of decoration. 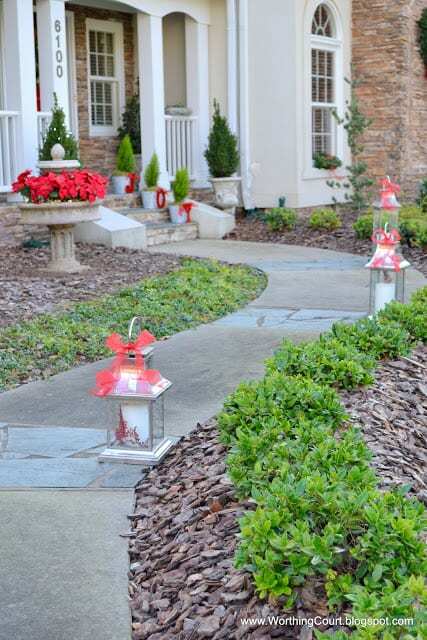 Love the lanterns, “JOY pots” and evergreens in the urns. Can’t wait to see inside her home. See ya Tuesday. Beautiful. Can’t wait to see more. What a festive entry. Love the pops of red. What a beautiful home! 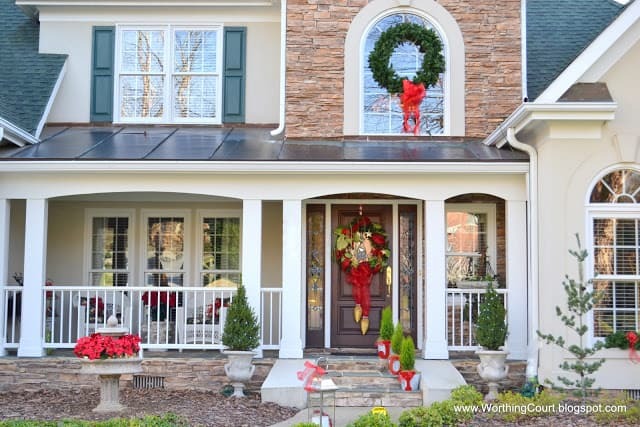 Your Christmas decor is so festive and perfect! What a very beautiful home! Everything looks so welcoming! Especially love the wreath! Your home looks beautiful! I love all the greenery! I’m a new follower and I hope that you’ll follow me back! Merry Christmas to you and your family! Please tell Nancy that her house is decorated so lovely. Also send her to my blog and look at my House Tour Gallery Tab. My home is much like hers with hers being larger. When I first saw the picture, it looked very familiar with the layout of side entry garage, roofline, and I think she will think the same. What a beautiful home and I love all her Christmas decor. The wreath is gorgeous! 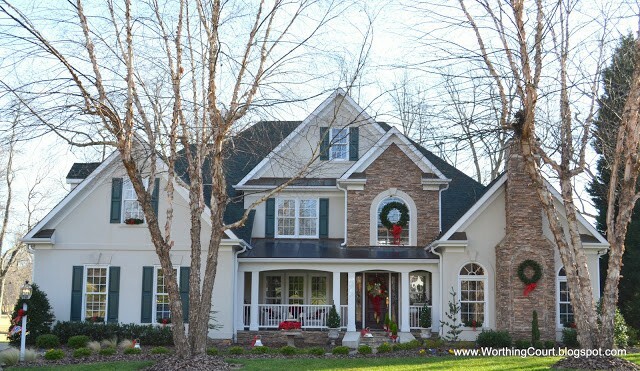 Nancy’s home is truly gorgeous, inside and out! Thank you for sharing this beautiful post at Potpourri Friday! Have a very Merry Christmas and wonderful Holiday Season! What are the small plants that line the outer walkway in the third photo? Hi Brandon. They are a type of holly bush that doesn’t grow tall. I’m sorry, but I don’t know exactly what variety they are. If you show the photo to someone at a nursery, they may be able to tell you.